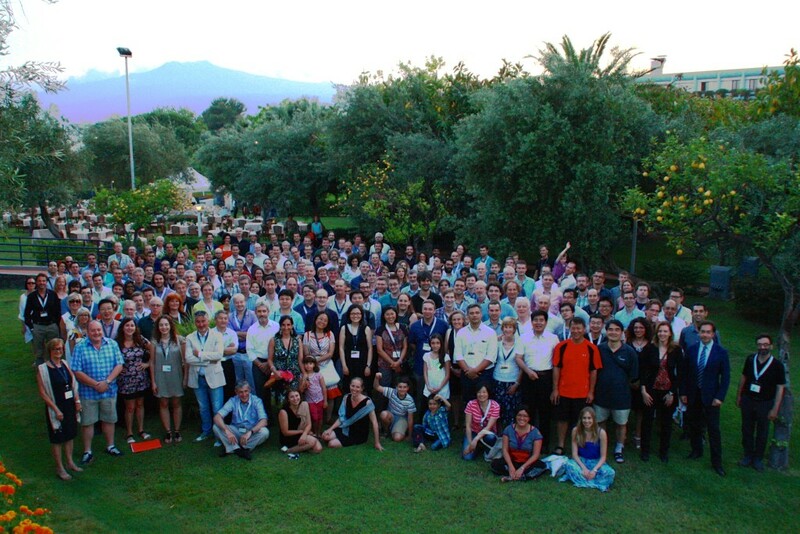 Official photo of the Advancing Astrophysics with the SKA conference held in Giardini Naxos June 8-13 in the gardens of the Atahotel Naxos Beach, with Mount Etna in the background. 13 June 2014, SKA Science Conference, Giardini Naxos, Italy – The Advancing Astrophysics with the Square Kilometre Array conference held from June 8-13 in Giardini Naxos, Italy, is coming to an end today. The conference has brought together more than 250 scientists from around the world presenting results in fields as diverse as cosmology, exobiology, pulsars or cosmic magnetism, focusing on the game-changing capabilities the SKA’s diverse instruments will provide to their fields of research. As the conference wraps up, there is palpable excitement and enthusiasm among the science community, following an intense week of engaging science talks showing just how the future SKA observatory, with its diverse instruments, will allow research in many different fields, including radio-astronomy but also beyond to fundamental physics. “This week has shown a fully engaged scientific community that sees the SKA as a transformational tool that will alter our understanding in many different fields, in astronomy but also in fundamental physics and potentially beyond” declared Prof. Philip Diamond, Director-General of the SKA Organisation. Ten years ago, in 2004, the comprehensive ‘Science with the Square Kilometre Array’ book was published. Since then numerous and unexpected advances have been made in the fields of astronomy and physics relevant to the capabilities of the SKA. The SKA itself has also progressed from an idea to a developing project with a baselined design, many ongoing engineering activities around the world and construction planned from 2018. The talks that were given this week will be compiled into a comprehensive Science Case, highlighting some of the key science projects that will be done with the SKA. They are defined as projects that need to address questions in fundamental astrophysics, that need to be unique to SKA or radioastronomy with SKA playing a key complementary role to other existing observatories, and that need to excite the broader community. In particular, the talks generated a lot of excitement and expectations in the field of pulsars and gravity, where it is expected that the SKA will bring the capability necessary to detect and characterise gravitational waves, predicted by Einstein but never directly observed. With the first gravitational waves hoped to be detected in the next few years, the SKA will allow the identification and characterisation of the sources of these waves, and will be used to conduct studies of extragalactic pulsars. By looking at pulsars, the SKA will also enable astronomers to conduct tests of gravity in extreme conditions, improving our understanding of how gravity works. Chris Carilli, NRAO’s Chief Scientist said that “the impact of such research will be dramatic”. Another field that showed great promise at the conference is the study of the Epoch of Reionization, the time, early in the history of the Universe, when the first celestial objects, proto-galaxies and stars, started to form through gravitational instabilities and their light ionized the neutral material around them.. By detecting the emission from neutral hydrogen (hydrogen before it was ionised), astronomers using the SKA expect to be able to push even further back into what is known as the Dark Ages, the time prior to the first structures such as galaxies and stars, thus giving astronomers invaluable insights into the early period of the Universe. This research is critical to our understanding of the early Universe. Other talks at this week’s conference also highlighted the SKA’s game-changing capabilities in a number of other fields, in particular the traditional and fundamental fields of radio astronomy, such as the study of cosmic magnetism to get a better understanding of how magnetic fields form and evolve in the Universe. The SKA is expected to be able to map the magnetic fields of thousands of galaxies up to redshifts far beyond today’s capabilities, thus ultimately leading to a better understanding of star-formation. Combined with the study of magnetic fields on large-scale structures in the Universe, such as galaxy clusters – groups of hundreds or thousands of galaxies, the SKA will help map the distribution of matter and establish the global structure of the Universe – how galaxies and matter clump together and how these clumps are connected – known as the cosmic web. Research on galaxy evolution, star formation and matter accretion is also expected to benefit significantly from the SKA’s capabilities, yielding a deeper understanding of the history of the Universe and thus addressing fundamental questions in cosmology, such as dark matter and dark energy. A number of talks also focused on other areas of research that, should astronomers use the SKA in these fields, have the potential to fundamentally change our understanding of the Universe. In particular, these fields include exobiology, with the study of the presence and distribution of pre-biotic molecules in the Universe, the building block of Life, the study of matter accretion and the formation and evolution of proto-planetary disks as well as the search for extraterrestrial intelligence, with the SKA being expected to detect potential signs of civilisation up to dozens of light years from Earth, which represents a comprehensive study of hundreds and possibly thousands of solar systems in our neighbourhood. The talks given throughout the week highlighted the integral role pathfinder telescopes have played in the process (such as the JVLA in the US, LOFAR in the Netherlands, etc.). A number of these pathfinder telescopes were deployed from the beginning with the goal in mind to enable engineers to test technologies and allow astronomers to conduct early research and refine the key science fields leading up to the SKA. As such, they are a great success in themselves. Precursor telescopes – pathfinder telescopes located on the SKA core sites in Western Australia and South Africa – have also seen great progress. The Murchison Widefield Array (MWA) in Western Australia which is conducting research in the low frequencies has been routinely operating since July 2013, the Australian SKA Pathfinder (ASKAP) also in WA is currently being commissioned with 6 of its 36 antennas already conducting science-grade observations, and MeerKAT, the South African precursor telescope under construction, with its first antenna recently inaugurated. “We’ve had an intense week of first class science presentations from the community that truly show just how much the SKA will add to our understanding of the Universe.” concluded Prof Robert Braun, Director of Science at the SKA Organisation. “Not only has the science case for the SKA grown even stronger, but we’re also more excited than ever about the “unknown unknowns”, the other discoveries we cannot even predict but are sure the SKA will bring”.